6 DOF manipulator (waist, arm, forearm, arm rotation, arm, wrist rotation), all-metal arm, the bottom of the joint high-quality all-steel bearing fixed. Beautiful and durable structure, roughly the size of the arm, such as pictures in the standard, lots of different size may be small change. 1The baby design concept from ABB palletizing robot, the same principle structure, range of motion is greater than other similar arm. 2frame material selection thickened hard aluminum alloy CNC machining, do not take other than store materials, material thickness different. 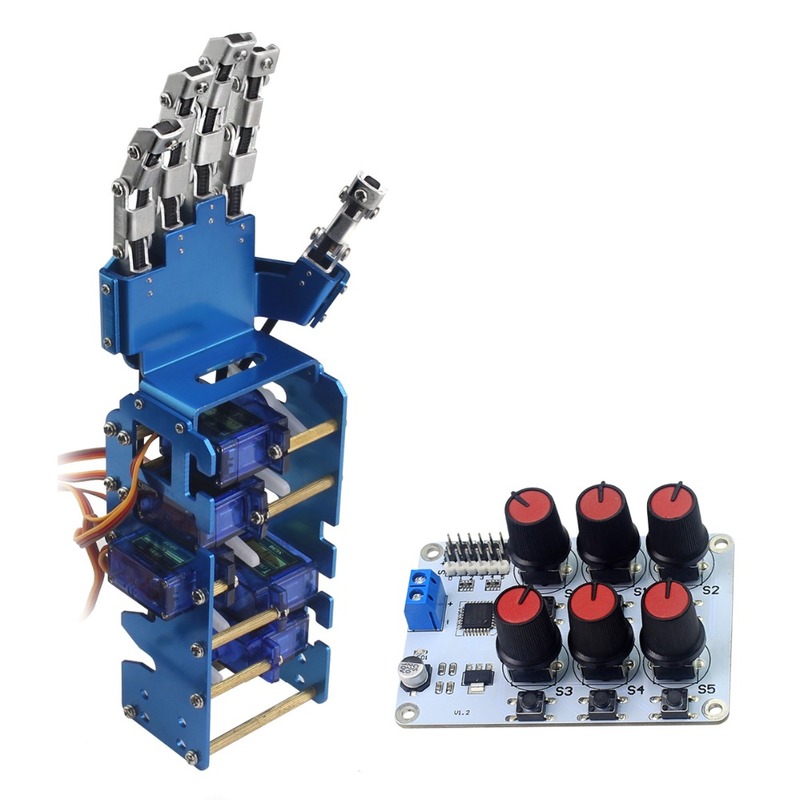 3 arm adopts full metal gear servos 6 MG996R bottom joint use two servo driven, forceful two times, two servo drive servo drive is more stable than a single. 4 bearing all the moving joints using high quality links, better performance. 5 After the machine arm the MPU plus a fixed base, with the arm movement, even more convenient and beautiful. 6 The baby design size and accuracy, especially suitable for teaching and testing. 7 large bearing fixed, fixed base machine movement arm no longer shaking, bearing better performance. The length of the arm is not doing as long as possible. The longer of the steering load is large, direct impact on the life of the servo, the servo circuit overload Assembly burned, damaged steering gear. It must have a direct impact on sexual performance arm, the longer the arm strength is smaller, the smaller the available load. The manipulator calculated based on generic metal gear steering servo circuit loads and loads to best fit, play to the best performance servos. Use high-quality all-steel chassis arm bearing fixed, fixed base machine movement arm no longer shaking, bearing better performance. The bottom of the joint using two servo driven, forceful two times, two more stable than single servo drive servo drive. NOTE:this is just a model,without controller,and power battery. We will ship Worldwide via Air Mail by China Post. Delivery Time is approx 15 - 28 business days to most US / UK / AU destinations. Item will be mark as "Gift" with lowest price. If insurance costs are not paid, the item was sent by normal airmail service, there is no tracking number can be checked. if paid for insurance costs, we will mail informe after shipment the tracking number, you can be check in the online. When the parcel reaches you, please do check all the parts and goods quantity inside before signing it. If there is any physical damage, missing items or wrong quantity, please do not sign it and request the post office or the delivery company to issue some relative certification in order for compensation. (It is legal and reasonable request. Both the Post office and the delivery company have no right to refuse to do so). Also, please contact us regarding the problem as soon as possible. Once you have signed the parcel, it means that you have no doubts about the products as well as the quantity and the transaction is deemed to be completed. We will be not responsible for any claim on missing items and damaged goods request. The same terms apply to anyone signed the parcel for you. We will leave POSITIVE FEEDBACK after receiving the payment. Please contact us first before giving a non positive feedback. Thank you for giving us a chance to make things right by good communication. Much thanks for you looking!